The Toronto Coin Expo, Canada’s premier coin & banknote show, is on tap at the Toronto Reference Library. Geoffrey Bell Auctions is once again official auctioneer showcasing an outstanding array of decimal coins, medals, paper money and tokens. The Richard Cooper Collection features numerous Canadian rarities. 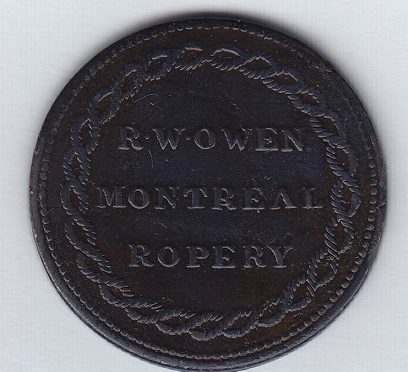 The Owens Ropery token from Montreal is one specimen seldom encountered and estimated to be hammered down at $15,000-$20,000. The Owen’s firm lasted only a few years hence the token’s rarity with few surviving. This token can be found in the online catalog for the April 22nd session at Lot 783, and carries a full description and photos for inspection. A second token of note is the very rare Hunterstown token also offered on April 22nd. Presented at Lot 787, it was issued by a lumber company in Hunterstown, Quebec. Employees were paid with the tokens. Few specimens have survived and therefore are expected to bring $10,000-$15,000. Absentee bidding on this token is already brisk and it will fetch a premium price. A detailed description is available on the item page in the online catalog. Coming up shortly after the token, is a very scarce Weir & Larminie encased one cent United States stamp at Lot 790. It is anticipated to bring $7,000-$8,000. This firm of Montreal bankers was the only Canadian company to use this type of token because of a shortage of circulating coin. This is a very rare piece and will command premium bidding action and it may very well be the finest known specimen of its kind. The Bell auction also includes the most extensive collection of Presbyterian communion tokens offered in many decades. These crudely made pieces of base metal were used commonly before 1867 in the Maritimes, Quebec and Ontario. Tokens were given to church adherents by church elders who acted as moral watchdogs. Those that didn’t pass the moral test were denied communion. The tokens showed biblical images of the Bible, communion table or the burning bush for example. All lots in this catalog are available for online browsing with photos and descriptions. Absentee bidding is currently open in the online catalog. The auction days are Thursday April 21st and Friday April 22nd 2016. Both sessions open for live bidding at 6PM Eastern Time. Geoffrey Bell Auctions and iCollector.com are excited to bring this auction to a worldwide audience, and will answer any questions from bidders about the pieces up for auction or how to get involved.